The firm began in 1926. George W. Butler and his brother Donnie, owners of Butler Furniture Company in downtown Roseboro, formed a partnership with Mr. L. M. White. The new funeral service business was called White and Butler. The business was headquartered upstairs in the furniture store. After Mr. White's death about two years later the name of the firm was changed to Butler and Butler. Donnie died a few years later, leaving George, or "Willie" as he was known, to run the funeral and furniture business. George was eventually joined in business by three of his sons, Carmen, Arnold and Murray. 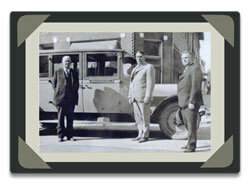 George retired in the early fifties and his sons took over the business. They decided to build a funeral home a few blocks down the street. In August, 1953, Butler Funeral Home was officially dedicated. The facility was hailed as one of the finest in the state at the time and was one of the first buildings in this area built exclusively for use as a funeral home. George passed away in 1957. His youngest and last remaining son, Murray passed away in 2000. The firm is presently owned and operated by Murray's son, Robie and Andy Wood, a 25-year veteran of funeral service who joined the firm in 1992. In May, 2005, a new 9600 sq. ft. facility was opened in Stedman, becoming the firm's second location.